France is the land of opportunities for marketers the world over. Alike others, if you too are looking to expand your marketing efforts in the region, Blue Mail Media’s France Business Email Database can solve your problem. Our database gives you complete access to marketing information you may need to execute your multi-channel marketing campaigns. Whether you wish to reach your target B2B customers via telephone, email or mail, our list has all the relevant data to meet your needs. 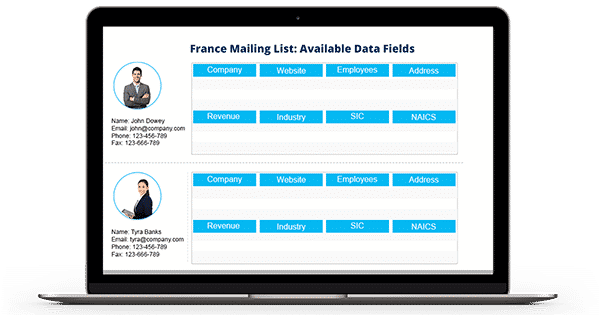 With our French Business Executives Database, you can unlock seamless interactions with your target market and achieve higher response rate, conversions, and eventually better ROI. Blue Mail Media has evolved as one of the most reliable sources of marketing data across the globe. Our team of data scientists, researchers, and business experts invest significant time and efforts in acquiring data from the authentic sources, verifying information for correctness and constantly updating the same with latest feeds to maintain its accuracy. Our France Mailing List can be availed in a pre-packaged form, or you can request a customized list based on your campaign specific requirements. Blue Mail Media has developed a strong network of data partners across the world. This enables us to serve clients across USA, UK, Canada, Europe, Asia, North America, Australia and other regions across the globe. We believe in treating each business with a unique approach and go an extra mile to serve clients based on their key objectives from the campaign.